What is a Powerpole "Set"? Anderson Power Products Powerpole connectors are available bagged in popular sized sets with volume pricing. A "Set" includes all the parts needed for a single connector. 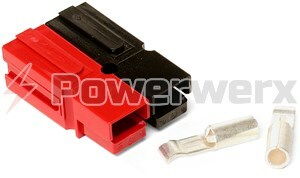 For the 15, 30 & 45 amp Powerpole connectors; a set includes (1) red housing, (1) black housing, (2) contacts and (1) roll pin. 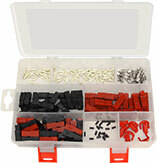 We offer bagged quantities of 10, 25, 50, 100, 250 & 500 sets. A 10 set bag contains 10 connectors, the same as 5 mated connector pairs, or exactly (10) red housings, (10) black housings, (20) contacts and (10) roll pins. 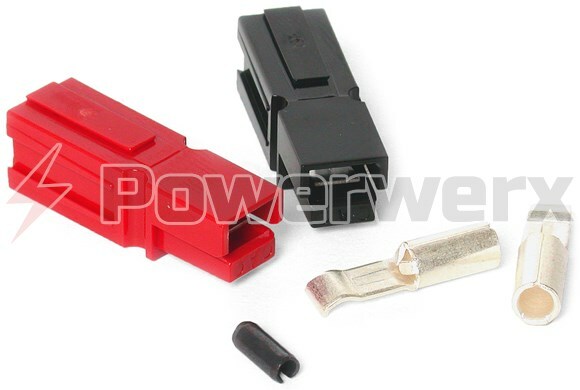 Powerpole connectors become polarized when the red and black housings slide together via molded-in dovetails on the housings. Connections can be quickly made and remade sightlessly or in the dark. Unassembled sets can be assembled in any configuration. As two housings slide together via molded-in dovetails, two half rounds align to form a channel that accepts a slotted roll pin. This prevents the housings from sliding apart. The roll pin is a compression fit and will not fall out in operation. 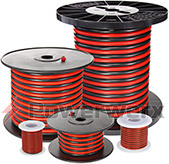 Powerwerx now offers Red/Black Powerpole sets that have been ultrasonically welded together which creates a permanent bond between the red and black housings. This can save assembly time, guarantee correct configuration, eliminate the need for a roll pin and enable the use of Powerpole accessories such as retaining clips or block-lok clamps. The size of the wire a Powerpole contact will accept is the primary limitation of their ability to carry a load. The size of the flat contact area is actually the same for all 15, 30 & 45 amp contacts. Powerpole connectors will safely handle higher loads or surges, please read the PP30 data sheet for additional information. The contacts are made of highly conductive silver-plated copper for minimal contact resistance at high currents. The average contact resistance is 600 micro-ohms. This system allows for minimal contact resistance at high current. The self-wiping action cleans contact surfaces during connection/disconnection. The contacts are rated at 10,000 no-load connect/disconnect cycles. When two pairs are mated together, it takes approximately 3 pounds of tension to pull them apart. Good connectors should not lose contact tension under use or vibration. Powerpole connectors use a stainless steel spring which applies 25 lbs. of pressure to hold the silver-plated copper contacts firmly together and maintain constant contact. This is ideal for frequent connect/disconnect cycles. Other cheaper connectors simply depend upon soft copper that eventually spreads apart and becomes loose. Powerpole housings have a modular design that allows for multi-pole (multi-conductor) configurations. Housings slide together via molded-in dovetails. I fly several electric airplanes and wired these to my ESC's and Batteries. No more soldering, no more having various connectors. In my opinion, these are a must if you like to simplify and just do more flying. I'm using the 30amp for most everything and they are in a word...GREAT! You should also consider the crimper they suggest. It's very much worth it. I have a number of solar panels and battery systems for use with our local ham radio emergency service. All radios and peripheral devices now have a common connection system. No more improvising in the field under less than optimum conditions. I'm always tinkering with something or another, and lots of projects incorporate 12v SLA batteries as a power source. I used to use spade connectors and euro-style terminal blocks for a lot of stuff, but once I discovered the versatility of the 15/30/45 amp Powerpole connectors, I was hooked. Now all my gear is set up with the common Ham radio "red right tongue top" standard. Hooking batteries up to a charger is safe and easy, and it's simple to put a Watt's Up meter in the system in either direction. I love it! I've been wiring things together for years at least 30. I found about these at the HAM club and started using these for all my radio gear red,black,white. White for direct bat feed and Red for key on power. So far no problems. I haven't done any vibration test, but if there using them on RC Helis, that's plenty a good test for vibration. I use to fly 600's.gas and lipo. I would recommend these for all ham gear. I just wished there were a coax LMR400 redesign for something like these. It's about time for coax connectors to be reinvented. After all, there are single twist connectors out there. The Power Poles have been selected by the NTrak organization (a national organization for N-Scale Modular Model Railroading) as the new standard connectors for it's module wiring. They are easily available, inexpensive and reliable. We need high current low resistance connections to meet the stringent requirements of Digital Command Control. I've been using 30A Anderson plugs on high power electric bikes and go karts for a couple of years. I regularly exceed the rated 30A @ 90V but never have problems with them. Here's a tip- buy in bulk and get the proper crimping tool... when you find out how good they are you'll want to replace the plugs on all your stuff with these lovely neat and reliable beasties! I started using these years ago for electric RC. Never one failure, or problem. These things handle a ton of power too. Way better than any other connector on the market, definitely better than Deans. Just bought the crimper this year, worth every penny! I should have bought it years ago! After using EC3 and Deans connectors, I have finally converted my whole electric-powered RC heli fleet to PP. PP are a dream! Easy to assemble, and easy to operate at the field. They click together and go apart so nicely, you could do it with one hand. The 30 Amp rating is confusing: For our RC application, these PP can take up to 200 Amp continuously. The 30 Amp rating is actually for regular household wiring at 110V (so over 3,300 Watt!). For more technical details see the RC Fly review at the URL below. I gave the Anderson Powerpoles a try after reading a few positive things about them in RC Forums. I fly RC planes and drive RC trucks. For those who don't know, there is a great deal of amperage required by the "Hobby Class" RC vehicles. My RC planes draw an average of 30 to 40 amps. My RC cars with brushless motors can draw upwards of 80+ amps at full throttle. Due to this high amp draw, you need a power connector that can do the job. The toy grade Tamiya connectors that often come preinstalled on the cars and batteries are not up to the task at all. They come apart, overheat, melt and bottleneck the current. I have used Dean's Connectors for quite a while. I didn't really care for them because of the soldering required. I honestly had a hard time getting a good solder joint because I had difficulty holding the wire completely still while the solder cooled. I also had to be careful not to warp the connector in the process. Deans connectors can also be hard to get apart at times and have very little surface to grip. Often, I was having to hold on to the wire while pulling apart due to the small connector and lack of grip. Results = broken wire. Not an issue with Anderson Powerpoles. I changed out 3 RC Trucks, and 6 batteries in about 10 minutes. The wire is stripped, put into the barrel, crimped, then the barrel slid into the housing. Very easy. No soldering, no mess! The connectors are slotted so you can lock a set together in different configurations. The plugs click together easily and stay together. A slight tug is all that is required to pull them apart. Powerpoles are great for anyone with the RC hobby. Very easy to install, and easy to connect and disconnect your power source. Holding a plane in one hand and disconnecting the battery with the other is no issue. They are easy enough to do that my 7 year old can now install his own battery in his truck without assistance. He could not get the Deans plugs together or apart before. I full recommend the Anderson Powerpoles to anyone who needs a great connection. They perform their task well and are easy for anyone to do. I have been using these in Large electric airplanes and helicopters with battery packs of 6S Lipo drawing upwards of 60 amps. They are never warm, do not arc, require little to no effort to connect or disconnect, their shape prevents reverse polarity connections, no soldering required, re-useable housings. Will never use a deans connector again! i could not ask for a better deal on connectors. they are very easy to install, with a good price. I've been using these connectors since 1987. I first used them on RC cars, boats and tanks. And those same connectors are still going strong. Now I use them for model trains. My order arrived right on schedule and exactly as described. The Powerpoles have been added to all of my rigs and now finding their way into other items. You cannot go wrong! I used a little dab of "Marine Goop" on the roll pin before inserting. Stays put but the pin can be easily pushed out if necessary. Thanks! The connectors are the best I ever had! They can handle 30A, are quite small and versatile to use. I equiped my entire shack with these and I'm planning to put sockets in the wall like they have here. A must have for Hams and if anyone would use these, all equipment would be interchangeable!